For all the untold number of paintings of classical myths, there are but a tiny number of works which strive to show historical events and scenes in the great classical civilisations. Even fewer of those show the most anomalous of the classical cultures, that of Sparta. Yet in recent years interest in Sparta, the Spartans, and their extreme way of life has risen, and is reflected in a wealth of modern imagery, in graphic novels, movies, and computer games. This article looks at some of the more significant paintings made of the Spartans prior to 1900. The single most celebrated event in Spartan history is the Battle of Thermopylae (480 BCE), in which three hundred Spartan soldiers (with 700 Thespians and 400 Thebans) were claimed to have kept over one hundred thousand Persians at bay for three days. This is the more remarkable for the fact that the Spartans and their supporters fought to the death, following which the Persians overran Boeotia and captured Athens. It is thus an example of self-sacrifice in the face of overwhelming odds, resulting in most noble defeat. 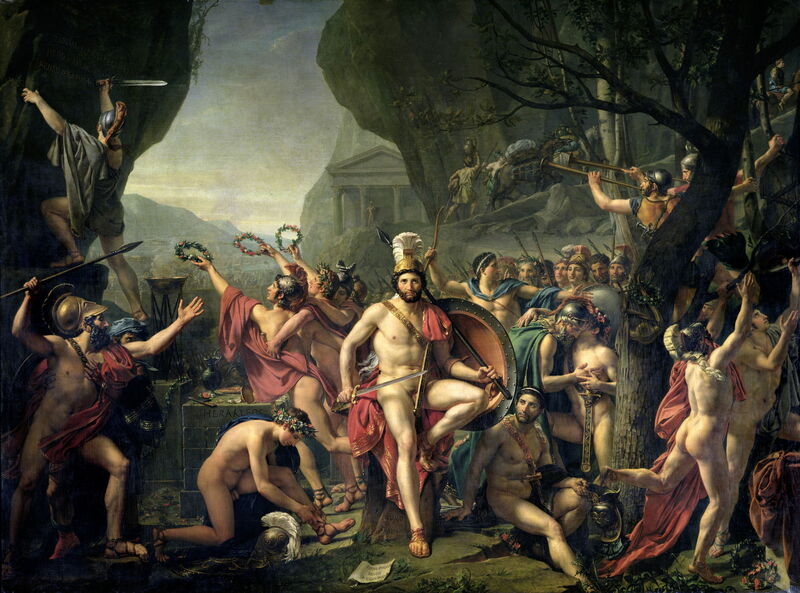 Jacques-Louis David (1748–1825), Leonidas at Thermopylae (1814), oil on canvas, 392 × 533 cm, Musée du Louvre, Paris. Wikimedia Commons. The only major painting which I have been able to discover of this is Jacques-Louis David’s Leonidas at Thermopylae (1814). Leonidas, the Spartan King and commander of the force, is at the exact centre of the painting, the viewer fixed in his emotionless gaze. Around him are the three hundred Spartan warriors, with supporting trumpeters, a lyre hanging on the tree, and laurel crowns being handed round. David leaves some clues to his narrative in inscriptions, which have unfortunately become barely legible. A soldier has climbed up to carve an inscription in Greek at the upper left, the word HERAKLEOS appears on a plinth to the left of Leonidas, and by his right foot is an anachronistic piece of paper bearing more Greek words. More subtle, perhaps, are the small groups driving pack animals along a narrow path at the upper right: the Persians were shown a mountain path around the narrow pass at Thermopylae, which enabled them to gain an advantage over the Spartans. Recent artistic interest in Thermopylae seems to have started around 1960, and first reached popular culture in Rudolph Maté’s 1962 movie, The 300 Spartans, which has been interpreted as comment on the Cold War at the time. This in turn inspired Frank Miller’s graphic novel 300, which was first published in 1998, and made into a highly successful movie of the same name by Zack Snyder, released in 2006. 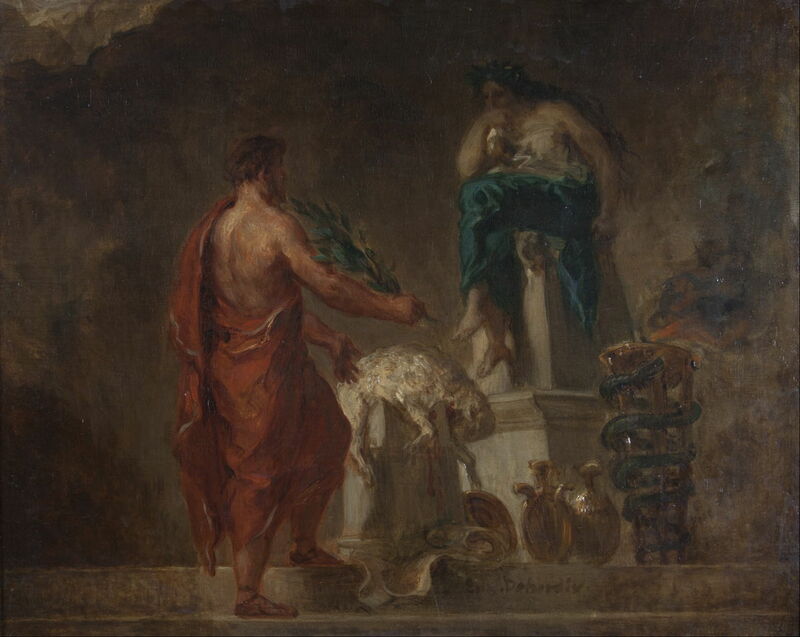 Eugène Delacroix (1798–1863), Lycurgus Consulting the Pythia (1835-45), oil on canvas, 32.8 x 41.2 cm, University of Michigan Museum of Art, Ann Arbor, MI. Wikimedia Commons. Other than Leonidas, the celebrated leader of the Spartans was Lycurgus, shown in Eugène Delacroix’s Lycurgus Consulting the Pythia (1835-45). Lycurgus lived sometime around 900-800 BCE, and laid down much of the law and institutions of the Spartan state, although he refused to be its king. Before he implemented these reforms, he visited the Oracle at Delphi, who told him that the state which observed his laws would become the most famous in the world. Pythia, the high priestess at Delphi, is here shown listening intently to Lycurgus, before she gives her prophesy. Spartan society appears to have been distinctive, perhaps unique, among the many small states of ancient Greece for its dedication to a single product: the perfect (male) warrior. From cradle to grave, males were reared, educated, trained, and worked for the single task of fighting the state’s enemies. Because Spartan women had the crucial role of producing infant warriors, and of keeping the state going while their menfolk were away for long periods training and fighting, they were highly valued in those roles. They were even encouraged to acquire supporting skills, which enabled two Spartan women to become victors in the Ancient Olympic Games. Lycurgus urged young Spartan girls to engage in wrestling, presumably so that they could defend the homeland when their menfolk were absent. The process of turning a male baby into an adult warrior is known as agoge, and is detailed in this fascinating Wikipedia article. Christoffer Wilhelm Eckersberg (1783–1853), Three Spartan Boys Practising Archery (1812), oil on canvas, 81 × 63.8 cm, Den Hirschsprungske Samling, Copenhagen, Denmark. Wikimedia Commons. 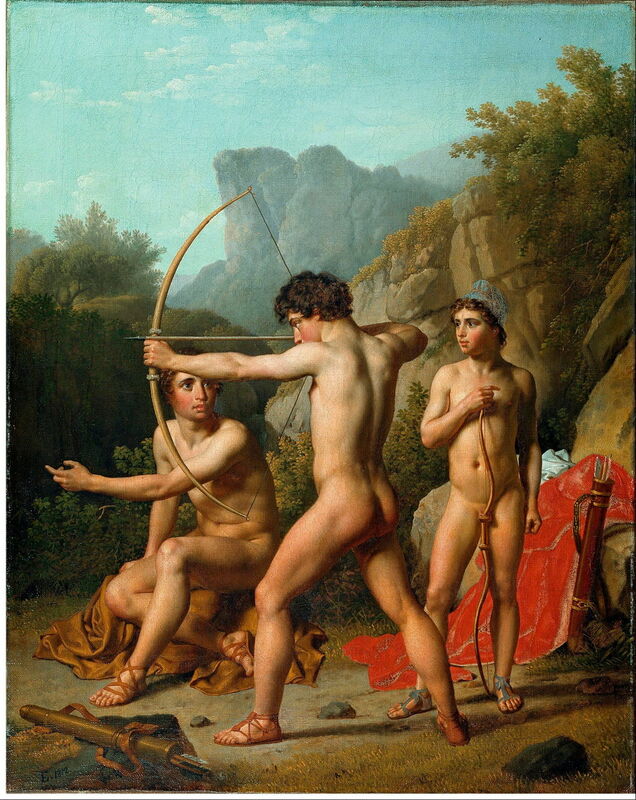 Christoffer Wilhelm Eckersberg’s Three Spartan Boys Practising Archery (1812) shows three young boys progressing through their training in basic military skills. Jean-Jacques-François Le Barbier (1738–1826), A Spartan Woman Giving a Shield to Her Son (date not known), oil, further details not known. Wikimedia Commons. 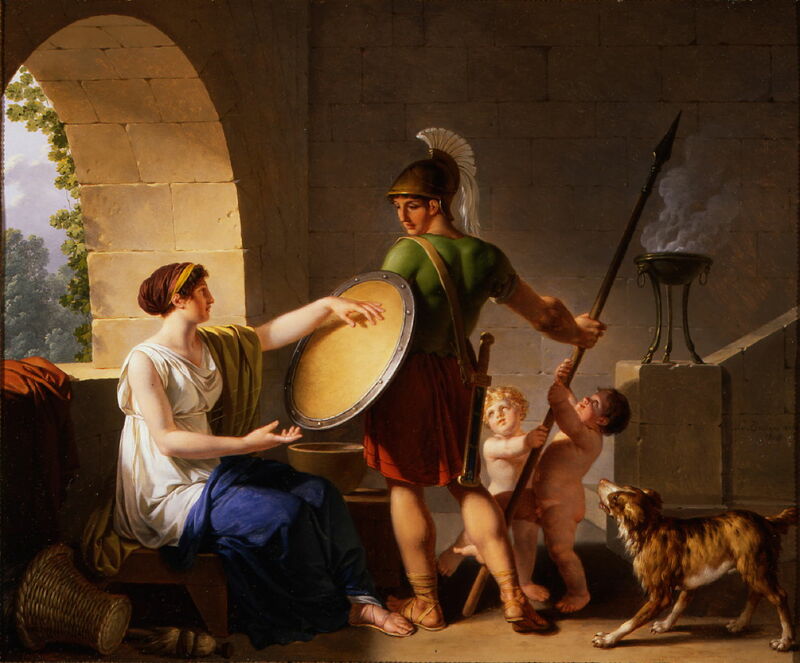 Once old enough and sufficiently skilled, a young man would be given his shield by his mother, as shown in Jean-Jacques-François Le Barbier’s A Spartan Woman Giving a Shield to Her Son. Although this work is undated, I suspect that it was painted in the latter half of the eighteenth century, between 1760-1820. The mother’s instructions would have been for her son to return either with his shield, or on it – he had to make a success of his training, or to die trying. Cesare Mussini (1804-1879) (? ), Education in Sparta (1850), oil, further details not known. Image by Pierre-Selim Huard, via Wikimedia Commons. 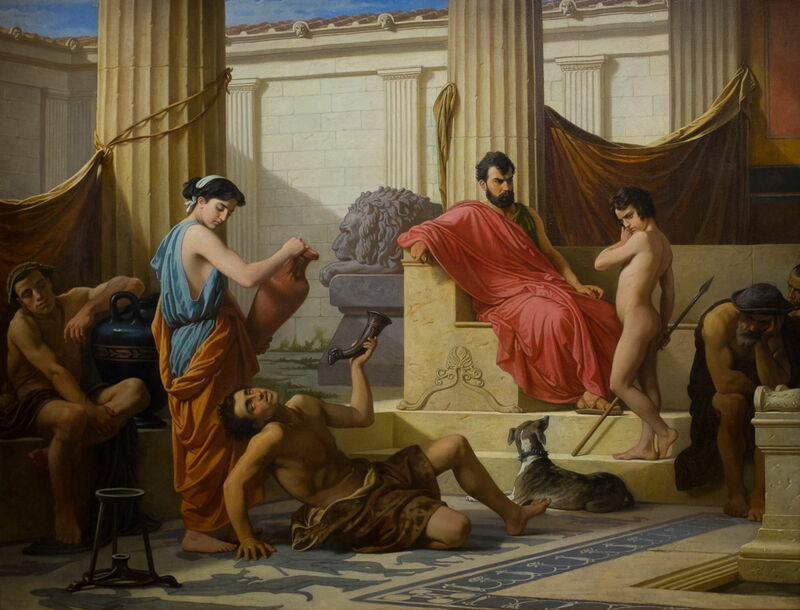 Education in Sparta (1850) was, I believe, painted by Cesare Mussini, or possibly his brother, and shows some of the less attractive aspects of the agoge, as one young man has clearly been overdoing the drink. There are also subtle allusions to the acceptance if not encouragement of pederastic relationships. If this work is by Mussini, the quality of its paint layer should be superb, as Mussini used his own resin-based formulation for oil paints. These were so successful that he was able to sell the recipe to H Schmincke, whose company has continued to sell oil paints based on Mussini’s formulation ever since. Although some of these paintings are quite well-known, by far the most famous depiction of Spartans is that by Edgar Degas, and now in the National Gallery in London. When Degas returned in 1859 from three years in Italy, he set to work on his first real masterpiece, showing The Bellelli Family (1858-67), and several history paintings. The best-known of those is his Young Spartans Exercising (c 1860). 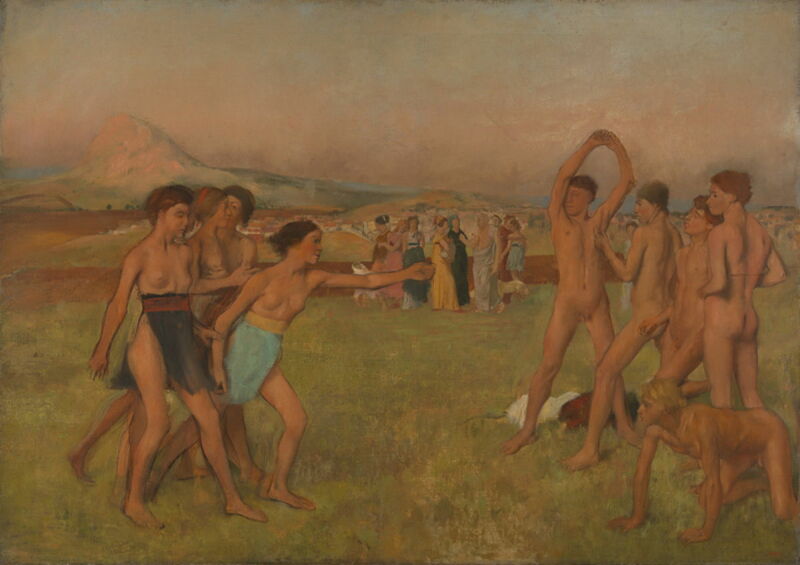 Degas’ starting point was the writings of Plutarch, whose account of Lycurgus and the training of Spartan children was the probable reference. Four Spartan girls, on the left, are seen taunting five Spartan boys, on the right, who appear to pose but not yet to respond to the taunts of the girls. Behind, in the centre of the painting, a group of Spartan mothers are in discussion with Lycurgus himself, who wears a white robe and has his back to the viewer. In the left distance is Mount Taygetus, where unfit Spartan babies were abandoned to see if they survived and merited life. Although Degas continued to work sporadically on this painting, it remaining unfinished when he died almost exactly a century ago. X-ray studies have revealed that what we see today is very different from its appearance in 1860. Degas himself was most reluctant to cast any light on his intention, or to give clues as to how this painting should be read. All this is very different from our image of other Greek states, such as Athens. 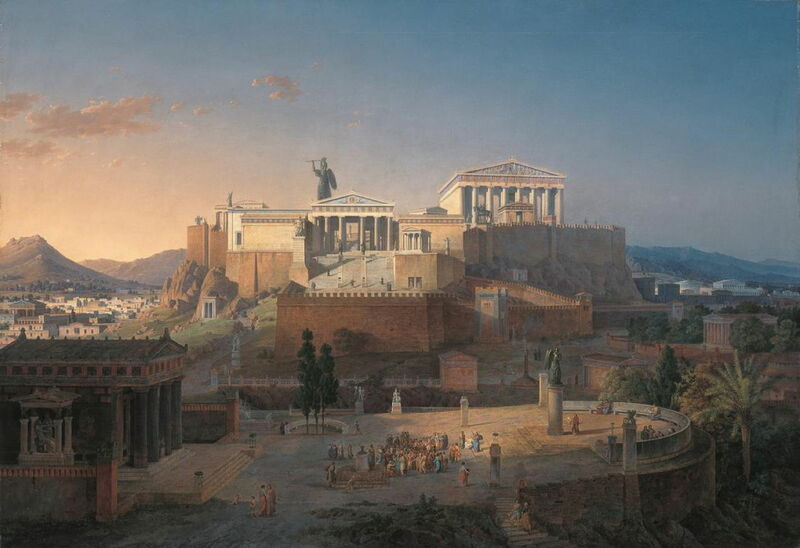 Leo von Klenze (1784–1864), The Acropolis at Athens (1846), oil on canvas, 102.8 x 147.7 cm, Neue Pinakothek, Munich, Germany. Wikimedia Commons. Leo von Klenze’s superb view of The Acropolis at Athens (1846) gives a beautiful picture of how many of us would imagine Athens at its height. Affluent and well-educated citizens are debating the issues of the day in an open forum, with the Parthenon and Phidias’ statue of Athena on the Acropolis behind. We have of course returned to sugar-coated myth again, but it does look gorgeous, and far from Spartan. Posted in General, Language, Life, Painting and tagged David, Degas, Delacroix, Eckersberg, Greek, Le Barbier, Mussini, painting, Sparta, von Klenze. Bookmark the permalink.